Keep this routine handy for when you NEED a workout, but you don't have much time. Whether youâre a mom chasing after your kids or a busy executive chasing hard deadlines (or both! ), we all have one thing in common: we donât have much free time. As the holiday season starts to wind down and resolution-season begins to ramp up, now is the best time to have this routine handy. Here, I share my favorite total-body toning moves that get the job done fast. As you re-commit to your fitness goals, there will be days in the coming weeks when you just don't have the time for say, a full group fitness class. But you will have time for this quick circuit. You'll complete 10-12 reps of each exercise. Rest for 1-2 minutes, and then repeat the circuit 2-3 more times. Stand with your feet slightly wider than shoulder-width apart, about 2 feet from a sturdy wall. 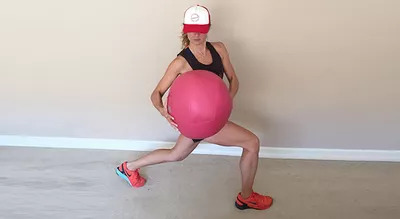 While holding a medium-weight medicine ball at your chest, squat down to parallel and as youâre standing back up, extend your arms to release the medicine ball up and into the wall. Catch the medicine ball as it comes down and move right back into your squat. Setup: Start with your right knee and right hand on the floor, with your body rotated out externally. Hold a dumbbell in your left hand straight above your head, and straighten your left leg so that your foot is about 6 inches off the floor. From here, bend your left leg and lower your left arm into the left side of your body, squeezing your left obliques. Return to your starting position and once youâve completed all reps for that side, repeat on the other side. Stand straight up with your feet together, holding a dumbbell over your left shoulder. Step out with your right foot and bring the dumbbell across your body and onto the other side of your right leg as you lunge down. Your back knee should lower to about 1 inch from the floor. 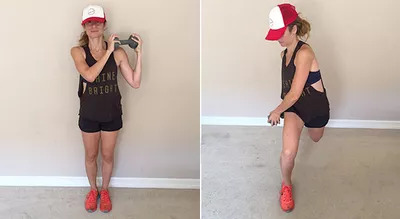 Step your right foot back and bring the dumbbell back over your left shoulder to complete the rep. Repeat all reps on this side before switching to the other side. While holding two dumbbells at your sides, stand straight up with your feet shoulder-width apart, chest out, and shoulders back. From here, squat down and place the dumbbells on the floor. Jump back into a push-up position, perform a push-up, and then jump your feet back to your hands. Lastly, stand straight up again and this time bring the dumbbells over your head for a shoulder press. Bring your hands back down by your sides and repeat for the allotted reps.
Get into a plank position with your arms straight and two dumbbells in your hands, placed on the floor. From here, perform a push-up. When youâve complete the push-up, rotate your body to the right, allowing your feet to roll over to their sides and raise your left arm straight up above your body. Return to plank position and repeat on the other side. Stand with your feet together, shoulders back, and chest out. While holding a medicine ball at your chest, step out with your right foot into a lunge. Hover here with your back knee about 1-inch from the floor, and rotate your upper torso to the right. Return to center and step your left leg forward to meet your right foot. Repeat on the other side and alternate through until youâve completed your allotted reps.
Jennifer CohenÂ is a leading fitness authority, TV personality, entrepreneur, and best-selling author of the new book,Â Strong is the New Skinny. With her signature, straight-talking approach to wellness, Jennifer was the featured trainer on The CWâsÂ Shedding for the Wedding, mentoring the contestants to lose hundreds of pounds before their big day, and she appears regularly on NBCâsÂ Today,Â Extra,Â The Doctors,Â andÂ Good Morning America. Connect with Jennifer onÂ Facebook,Â Twitter,Â G+,Â andÂ Pinterest.